White Chocolate Peppermint Fudge is a super easy recipe that tastes out of this world good! Creamy white chocolate mixed with peppermint is always a hit at Christmas! Fudge is hands down my favorite holiday treat to make next to cookies. There are so many flavor possibilities! 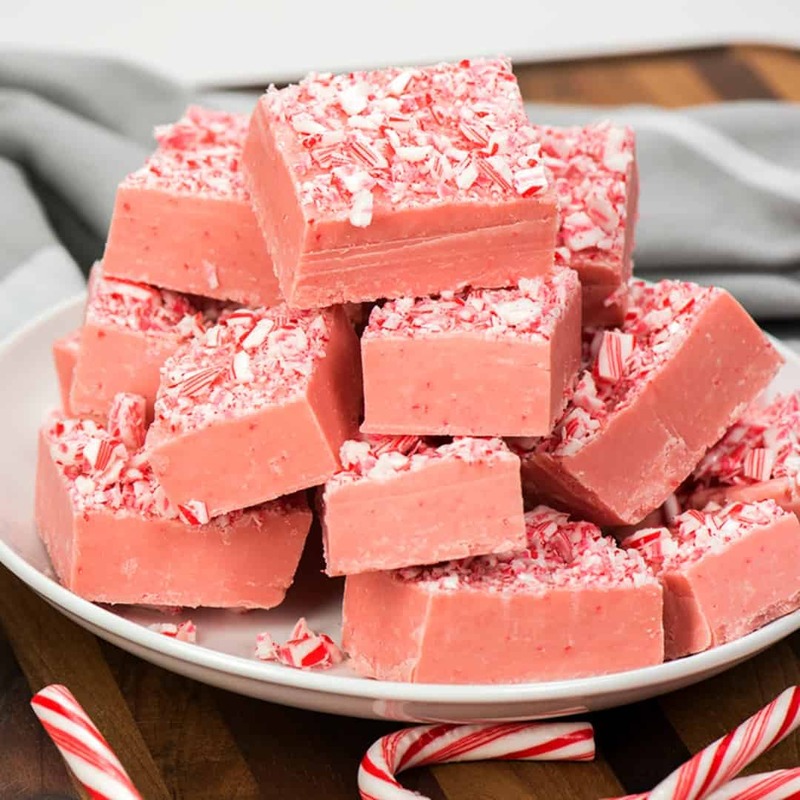 I make fudge all through the year, but this close to Christmas I’m all about peppermint fudge. 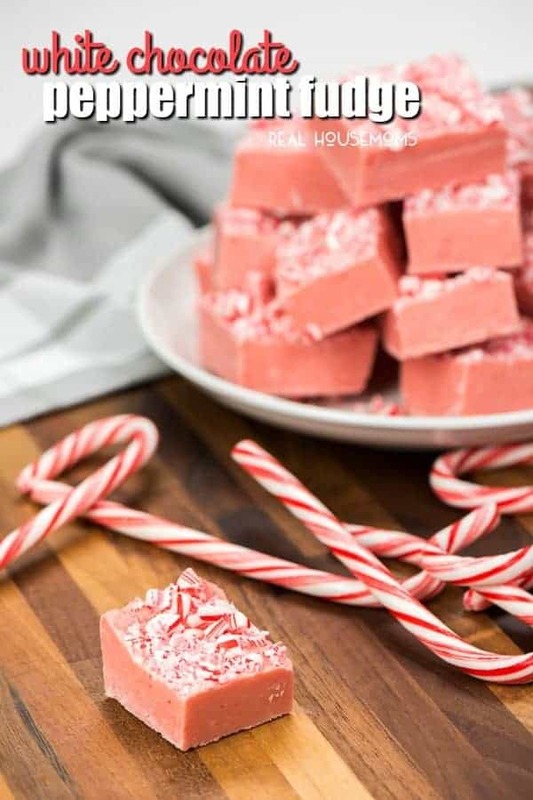 This easy peppermint fudge recipe is great for everything from Christmas cookie plates to filling tins with stacks of fudge for friends and family. This fudge is so crave-able I usually end up making two batches before Christmas. And then another after the new year. 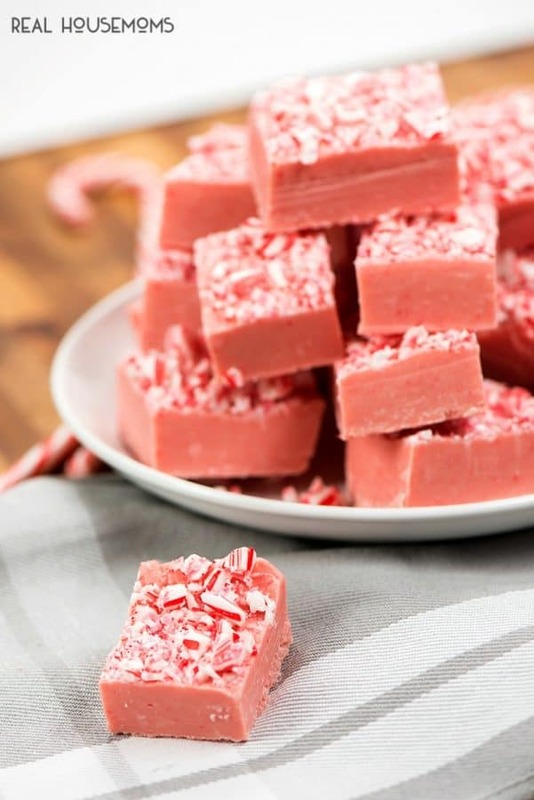 Because easy peppermint fudge isn’t just for Christmas! My biggest obsession at Christmas has become white chocolate and peppermint mixed together. I love the creaminess of the white chocolate and the sweetness of the peppermint together. I’ve been putting it in everything. My next biggest obsession at Christmas is quick and easy recipes. There is so much do this time of year! I have made it a point to set aside time every night to be present with my monkeys. We’ve been watching Christmas movies and specials every night all snuggled in our pajamas with blankets and a fire. I’ve been so happy getting all the extra time with my guys. It’s really helped to make this Christmas even more magical! I’ve been making treats to snack on while we watch. I made more Molasses Sugar Cookies and they were gone fast! I was having a busy day so I made a batch of White Chocolate Peppermint Fudge to have and it was a hit!!! We’ve been making A LOT of fudge here on Real Housemoms lately! We’ve made Snickerdoodle Fudge, Eggnog Fudge and even Cookies ‘n Cream Fudge! It’s such an easy Christmas candy to make. This is a very busy time of year for most people and so making sure that we can get the fun treats made but also keeping things simple is key! We loved this fudge. 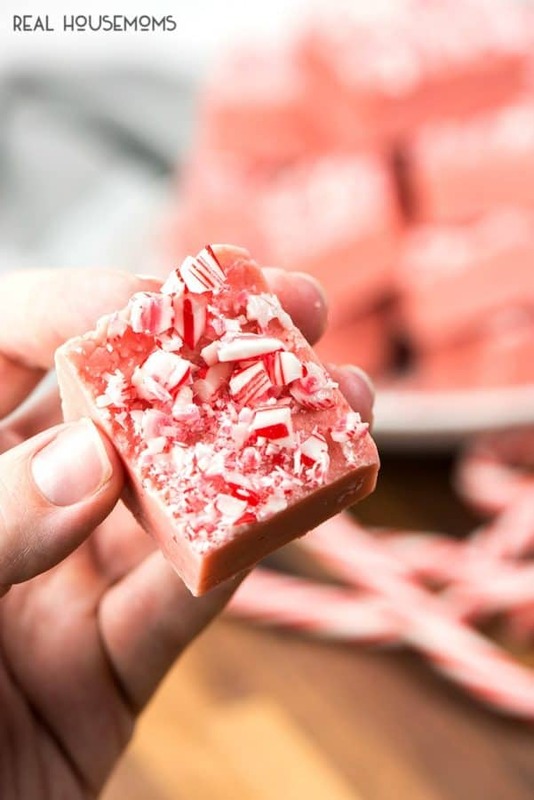 It has a delicious creamy texture and the top has the crunchy peppermint candy bites. I used both peppermint extract and peppermint baking chips to make sure that you could taste the peppermint. I found these at my grocery store, there’s a picture below. If you can’t find them you can get them online here or you could just up the peppermint extract to 2 teaspoons. If you do this you’ll have white fudge instead of pink but the candy on top may pop more for you. It’s really rich so I cut it into small pieces and I’m glad I did. I could easily eat the entire batch if I wasn’t careful! I hope you LOVE this fudge and I totally recommend making a batch as gifts or an easy last-minute treat to have with the family! Square Baking Pan: A square baking dish is a must-have for home cooks. Silicone Spatula: Rubber spatulas are one of those kitchen tools you don’t realize how much you use until they’re all dirty. This set of three spatulas in various sizes and shapes will make cooking everything from dinner to dessert a breeze. Peppermint Baking Chips: Add peppermint flavor to all your favorite desserts and drinks! These baking chips are creamy with a little crunch, and I like them better than candy canes for baking! *Add a few inches of water in a saucepan, place a bowl over top of the saucepan. Place the white chocolate and sweetened condensed milk. Can you melt the white chocolate chips in the microwave and add the sweetened condensed milk and then microwave together? I put the chips in a bowl and pour the milk over them and micro for 3 1/2 minutes. Then stir in the extract and mix until smooth. It will go from shiny to dull, that’s when you pour it in your pan. Have you ever swapped out the chips on this and made different flavors using this recipe for example peanut butter for one? Once you melt the chocolate, just stir in the sweetened condensed milk. There’s no need to microwave (or melt) again with the sweetened condensed milk. Im guessing this cant be made without the peppermint baking chips. We can’t get them in Australia. Actually, Rebekah in the post I give an alternative to using the baking chips if you can’t find them. Just add 2 teaspoons of peppermint extract instead of the 1 called for in the recipe. The fudge won’t turn pink, but it will taste great! Looks scrumptious! Can the fudge be made ahead of time and frozen? If so, should it be frozen whole or can it be cut first? Thanks for the recipe! WOW! Made these tonight and they are excellent! Couldn’t find the Andes peppermint candies but I did find nestle peppermint backing chips (they are red and white with a chocolate peppermint filling). When stirred j to the melted chips they turned the fudge a pretty dark pink and Chocolatey swirl color. It’s was perfect! Thank you! How thick should the milk and white chocolate mixture be when you take it off the heat. Mine was really thick, but the chips were melted. I don’t know what I did wrong because my fudge didn’t come out pink but im guessing it might have to do with the peppermint chips because my store had peppermint chunks not chips but it looks good for white fudge.